We are located about half way between Auckland and Cape Reinga, in the Northland region, Okaihau, on Horeke road , just next to the Cycle Trail. We offer a peaceful private stay that is perfect for a big family or for a group of friends. Sleep out and caravan. This listing is for our Sleep Out. Please note: bring your own linen or pay extra $10 per for linen for each bed - 2 sheets and 2 pillowcases. Bedroom 1: 3 double bunk beds with a single bed on the upper bunk. Bedroom 2 : 1 double bed. - parking for up to 8 cars. - linen cost $10 per a bed or bring your own. Check in and check out - to be discussed. A large room has a TV but it is only to watch DVDs, other TV available on a kitchen. There is also a wood burner to make a winter nights warm. Cats and dogs are welcome, but have to be under supervision as we have chickens around. Please note that we have noisy roosters ( specially at early morning) and a lot of wild peacocks around ! Possums are go around at night and they have funny angry voice. ? Please leave the rooms as you found it. If you would like to just pack and leave, a cleaning fee applies, just let us know. Years ago it was a big macadamia plantation with near 8000 trees. Currently, only about 1,200 trees remain on site, and the business has largely become a hobby. Rooms that previously housed plantation workers have been converted into guest houses, and these are becoming more popular with visitors every year. 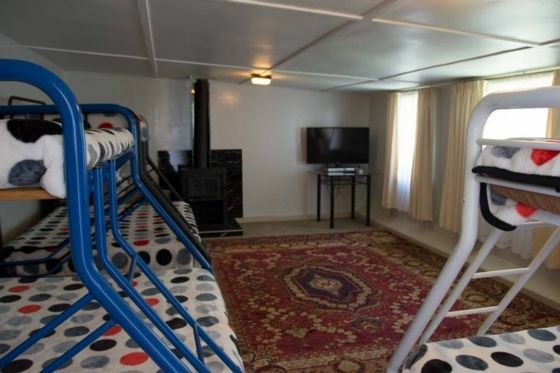 Extras: Cleaning (Optional, NZ$40.00 per stay); (Optional, NZ$10.00 per person); NOTE: Under Kiwi bach tradition you are expected to: Bring your own linen (towels/sheets); You do not need to bring tea towels. Our group of three adults and 9-year-old grandson found this a great base for our excursions to Waitangi, the Hokianga Harbour and finally Ngawha Springs hot pools to unwind from our travels. Plenty of accommodation space, with the small drawback of the kitchen and bathrooms being in a separate building to the bedrooms more than made up for by the charming setting and our host Irina's warm and ever-helpful hospitality. Our boy loved rounding up the cats and chickens and we were only sorry we didn't have more time to explore some of the hidden gems of Northland that Russian-born Irina and her husband Alexey have found and researched for their guests. Very nice and relaxing place to stay.I would also give the host 5 stars. Irina came to our rescue when we had some issues with our prebooked accommodation she responded to our message quickly and got the place ready for us at a very short notice.She was very friendly and welcoming,she made us feel at home.Its nice and peaceful environment is a great place to relax if you want to escape from the hustle and bustle of the city.Also there are plenty peacocks around.Thanks Irina for the fresh macadamia nuts.Would love to stay there again for our next trip to up north . We had two families stay at Macadamia Plantation farm stay. One family slept in the caravan, and one in the bunk house, although we’d have all fitted in the bunk house. It was a blissful stay! The kids all ran around the orchard every night hunting for peacock feathers or nuts or playing hide and seek or patting the friendly cats. We all slept like logs in the comfy beds. Irina was a wonderful caring hostess, and the facilities are all rustic but very clean. There are swings, a disco floor, huge well equipped kitchen, lovely hot showers, multiple toilets. What more could one want? It was like having a whole caravan park all to ourselves! I would highly recommend this farm stay for two or three families staying together to do parts of the Twin Coast Cycleway. We have made friends for life in Irina and Alexey. A+ hosts. We enjoyed our stay very much. Highly recommended if you want to get away and enjoy a few peaceful days in the countryside. Our dogs loved it too. The hosts were very nice, friendly and accommodating. It was a pleasure to meet this nice family and their beautiful dogs :-) . Couldn't have asked for nicer people. They are lovely, good communication from beginning to end. Rooms were left clean and tidy. They were great guests and we hope to welcome them here again. Thank you for staying with us ! Thank you for your nice words Yana, we are glad that all of you enjoyed your stay! The property was private, comfy, interesting and was accessible to major and munor thoroughfares.